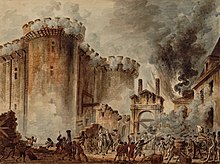 The French Revolution (1789–1799) was a period of radical social and political upheaval in French and European history. The absolute monarchy that had ruled France for centuries collapsed in three years. French society underwent an epic transformation as feudal, aristocratic and religious privileges evaporated under a sustained assault from liberal political groups and the masses on the streets. Old ideas about hierarchy and tradition succumbed to new Enlightenment principles of citizenship and inalienable rights.